It’s been almost 100 years since 1920. You can say the 20’s are making a come back, and why not? The 20’s was a time of social change, especially in the position of women: short skirts, short hair, and even the vote. People went to roadhouses and country clubs, danced the Charleston and the black bottom, smoked cigarettes and drank prohibition booze. The 1920’s was one big party– lots of money made and lots of money spent. The prosperity of the 1920’s was reflected in Cannon Beach in several ways. Prosperity for Cannon Beach meant more development. With the automobile becoming more affordable and more popular, the increase of motor traffic brought about six or seven auto camps to Cannon Beach. The auto camps consisted of “tent houses,” each tent had a stove and sometimes running water. The auto camp office was usually combined with a small grocery, and at some camps there was a dining hall. More development in Cannon Beach meant more diversions, diversions that to some extent would draw people away from the beach and fireside. Cannon Beach acquired an indoor swimming pool called the Natatorium, a roller rink, riding stables and a moving-picture show.The Natatorium, a grand Latin name given to the indoor swimming pool, was filled with water that had been pumped from the creek. The water was heated with cordwood, later with oil. The Natatorium also had four private bathrooms, which could be rented for twenty-five cents, a boon for those auto campers that didn’t have plumbing. Bathing suits could also be rented, woolen suits that seemed to never get quite dry. The Natatorium also had a balcony above the pool. The balcony had a nickelodeon, and thus became a popular place to dance. The Natatorium, located in the area of the present Whale Park. The roller skating rink was the Natatoriums principal competition. The roller rink was also a source of music, a calliope that played melodies suitable for execution of the figure eight marked on the rinks maple floors. Both the Natatorium and the skating rink were the sites of the first moving-picture shows in Cannon Beach. The film was usually projected on one of the outside walls, the audience bringing their own seats in the form of apple boxes. Horse riding in Cannon Beach in the 20’s. leisurely trot along the beach, preferably at sunset, followed by a bonfire and barbecue. There were also those that brought down their own horses by riverboat from Portland to Astoria, riding on from there to Cannon Beach. 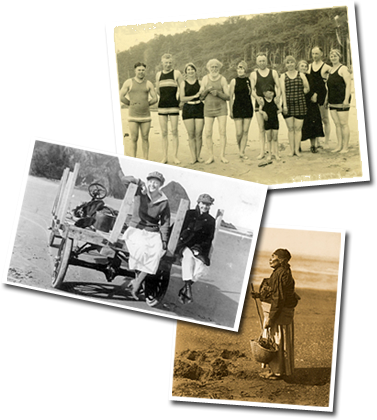 Looking Back, some view the twenties as the golden age for Cannon Beach. The locals made money while the summer people found all manner of recreation. Through the good times and bad times, those years in Cannon Beach brought untroubled serenity to many, especially when compared with what was to follow, with the stock-market crash of 1929 and the Great Depression that followed. That story, however, will have to be saved for another time.